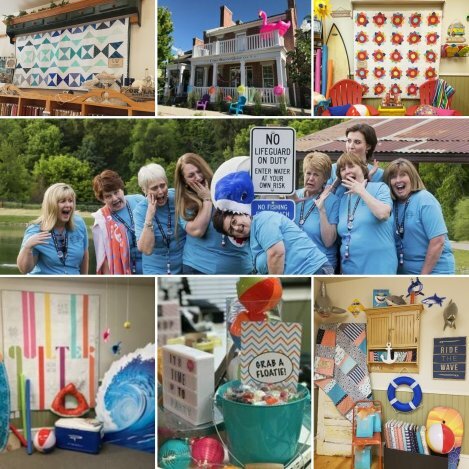 Who pulls together all of our fun displays? Find out inside! Plus - sign up for Beginning Quilting! What was the most asked question at our store during the Utah Shop Hop? “Who makes your shop look so fun year after year?” Answer: "It's Sew Shannon!" Shannon White is responsible for pulling together our creative displays and boy does she have a knack! If you haven’t met her, I’d like to take a moment to introduce you. She has likely helped you at the shop on a Tuesday or Thursday and you very well may have taken a bag or quilt class from her. She is friendly, bubbly and so much fun to be around. She LOVES all things red with white polka-dots; from fabric & scissors to cowgirl boots! She recently added “Dottie,” to her fleet - - a Featherweight machine adorned in, you guessed it, red with white polka-dots! Shannon has been with the Corn Wagon for about 10 years now but her roots in sewing run much deeper. Even her Mustang sports the word "sew!" Shannon is known for making the most fabulous bags and what she refers to as “quick-and-easy” quilts. They are always some of our hottest items here at the shop. She has taught sewing classes far and wide; in fact she’s currently away teaching at the Panguitch Quilt Walk Festival. Shannon and her good friend, Terry Griffin, hostess Cabin Fever, a spectacular biannual quilt retreat highlighted by Shannon's talent for building creative atmosphere around a theme. In other words, this girl knows how to throw a sewing party and makes every guest feel special. Many of you experienced that at last week's beach party. How does she do it? Our Shop Hop themes are selected very early on (I'm not kidding when I say we're already talking about ideas for next year!) and Shannon immediately has her radar on for anything that might make our shop shine. Displays, photo ops, treats, games and giveaways are all part of months of planning and collecting. It's so much fun to see it all come together and even more fun to see our customers enjoy it! When Shannon's not at the shop, she's likely out enjoying her cute grandchildren or traveling on the road with Mr. White. They always know the best stops, shops and yummy food along the way. Thank you Shannon for always sharing your creative spirit and bright smile with us! We can't wait to see what you come up with next! How many of you spotted this adorable Poolside Tote by, Noodlehead at the beach party? Mary Jacobsen used two panels from the "Just Beachy" fabric collection to make this roomy tote. It's perfect for all your beach adventures! Load up everything you need (holds up to 4 towels!) and never lose your keys in the sand thanks to a handy key clip! Pocket options and fun accents allow you to show off some of your favorite fabrics. Finished Dimensions: 7.5” D x 14.5” W across base, 14.5” tall, 23.5” including handle. Mary will be teaching a class for it here at the shop Thursday, June 14th, 6:00-9:00 p.m. Click here for more details and to sign-up online! Beginning Quilting Class! 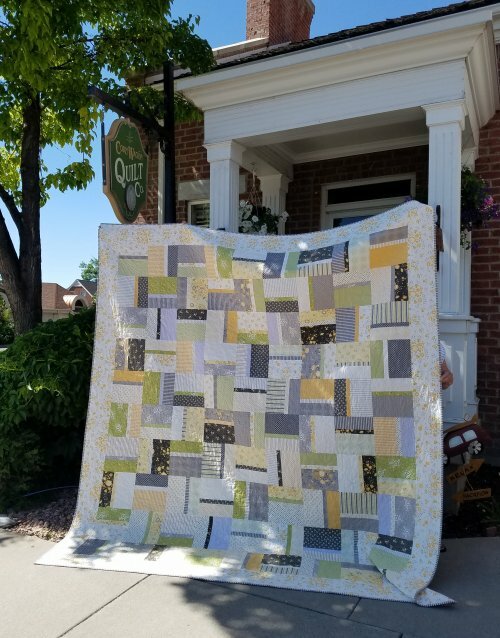 Learn all the basics of quilt making as Stacey Giles guides you through the process of making the Triple Treat Petite quilt by, Atkinson Designs. 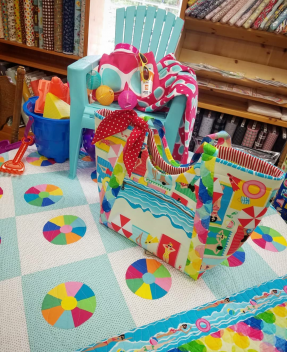 In this class you will cover the essentials such as fabric selection, fabric preparation, using a rotary cutter, seam allowance and seam matching, proper pressing, and even binding! The Triple Treat quilt is a perfect beginner project with easy, large-scale blocks that will allow you to practice the skills you will learn without being overwhelmed. You choose the size (baby, lap, twin, full…) and Stacey will teach you how! This class is for beginning quilters who are already comfortable using their machine. Class participants must be 16 years or older. Stacey would be happy to help you select your own fabric choices at the shop. $60.00 class fee include two days of instruction. Supplies must be purchased separately. Click here to join the fun! Corn Wagon Quilt Co. will open at NOON this Saturday, June 9th to make way for the Art City Days Parade! We will remain open until 5 p.m.
Monday, June 11th - 25% off all regular price NOTIONS & BATTING ! Tuesday, June 12th, 10 a.m. - Noon. Join our FREE Hand Applique & Hand Piecing Club. This club is for those who know the basics of hand applique or want to learn to hand piece. We will work together to improve our applique and hand piecing skills and get our own projects completed with a fun gathering of sewing friends! Tuesday, June 12th, 1 p.m. - 4 p.m. Wool stitchers and wool rug-hookers, UNITE! Join our wool club to work on your own projects and get help when you need it here at the shop. $15 includes 4 months.